With a track record spanning over 13 years, INITION is a multidiscipline production company specialising in producing installation-based experiences that harness emerging technologies with creative rigour. 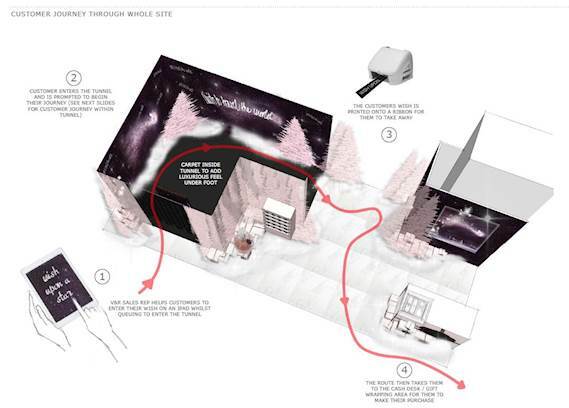 Задача: Leading visual communications agency Elemental Design approached Inition to help bring magic to L’Oréal’s Christmas “Wish” experience in Selfridges. Решение: Working closely with Elemental Design, Inition installed two Optoma EH415ST short throw projectors edge blended inside a tunnel booth for customers to see their Christmas wish written in the stars. Leading visual communications agency Elemental Design approached Inition to help bring magic to L’Oréal’s Christmas “Wish” experience in Selfridges. Inition used two Optoma EH415ST short throw projectors for the installation that were edge blended to create the extra wide image needed. These filled the very limited space inside the tunnel with the custom animated Christmas visuals. The booth was set up a several locations in the lead up to Christmas including Selfridges, London and The Trafford Centre, Manchester. Stuart Cupit, Head of experiential production said “This was a fun but challenging project to work on. Our challenges included filling the largest possible area with visuals inside the very limited space, creating custom animations, inspired by L’Oréal’s TV ad, and wirelessly networking the entry iPads to the computer running the multi-screen visuals. Elemental Design: is a full-service visual communication agency delivering 360 Degree retail and event solutions.